The senator is still in the running, still arguing that Democrats must adopt a boldly progressive economic message. For the second Tuesday in a row, Bernie Sanders has won a Democratic primary in a state that Hillary Clinton won in the party’s 2008 nomination race. Last week he took Indiana from Clinton. This week he has taken West Virginia. The Sanders win in West Virginia was a big one. The senator secured 51 percent of the vote to 36 percent for the former secretary of state. He carried every county in the state—taking several with over 60 percent of the vote. 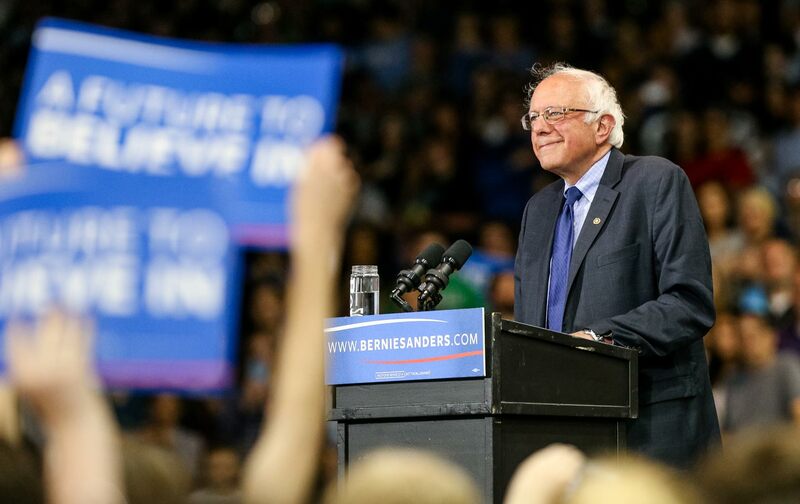 Sanders has now won 20 Democratic contests and 1,430 delegates. The senator is still trailing Clinton, who has prevailed in 26 contests and secured more than 1,716 delegates. Even as she was losing West Virginia, Clinton picked up 11 pledged delegates. And with unelected superdelegates counted in, Clinton is over the 2,200 mark in a race where 2,384 delegate votes are needed to win the nomination. Sanders says Democrats must build a broad anti-Trump coalition of Americans who are angered by economic inequality. Yet, with another primary state counted in his column, Sanders continues to upend the argument that Democratic race is done. He is still in the running. He will continue to compete for states and delegates—having declared in Oregon on Tuesday night that “we will keep fighting for every last vote.” He will continue to look for opportunities to shape the Democratic message for a fall race against the most divisive Republican nominee in modern political history. “Our message to the Democratic delegates who will be assembling in Philadelphia is, while we may have many disagreements with Secretary Clinton, there is one area we agree: We must defeat Donald Trump,” Sanders told thousands of cheering supporters in Oregon on Tuesday night. Tuesday’s primary wins will give Trump a boost as he goes into Thursday’s high-stakes meeting with House Speaker Paul Ryan. No matter how that meeting goes, however, the Democrats know they will be running against Trump. Clinton is toughening her talk on the key issue of trade. The question is how they will run. “Are you really going to stand up for the middle and working class when you’re collecting millions from Jeb Bush supporters?” asks the insurgent contender. That’s a message that played well Tuesday in West Virginia, where the ABC News analysis of exit polling found that “Six in 10 voters said they were very worried about the direction of the nation’s economy in the next few years, by far the highest level of economy worry in a Democratic primary this year—far above the average, 40 percent, and rivaling the customary level seen in Republican primaries.” Sanders ran especially well among voters who said they were very very worried about the economy, who said they thought trade policies harm US workers and who came from coal-mining families. Clinton took heat for saying in March that “we’re going to put a lot of coal miners and coal companies out of business.” In fairness, she promised in the same appearance, “We’re going to make it clear that we don’t want to forget those people. Those people labored in those mines for generations, losing their health, often losing their lives to turn on our lights and power our factories. Now we’ve got to move away from coal and all the other fossil fuels, but I don’t want to move away from the people who did the best they could to produce the energy that we relied on.” That’s not far from the stance taken by Sanders—who says Democrats should support “a carbon tax so we can effectively address the planetary crisis of climate change.” But the senator’s win in West Virginia (a state Clinton won in 2008 by a 67-26 margin) suggests the appeal of his economic focus. That focus could also prove to be appealing in the fall in Ohio, Pennsylvania, and other battleground states where some recent polls have suggested Trump is more competitive than had been anticipated. This is the point Sanders will make in the primary battles that are yet to come. The insurgent seems to be making an impression on the front-runner. Clinton has stepped up her campaigning in one of the next primary states, Kentucky, and she’s toughening her talk on the key issue of trade. “I have said I oppose the [Trans-Pacific Partnership] agreement—and that means before and after the election,” she replied to a question from the Oregon Fair Trade Campaign, a coalition of more than two dozen labor, environmental, and human-rights organizations that is sharply critical of the TPP deal. Sanders has long argued that the United States must “fundamentally rewrite our trade agreements to protect the environment and raise living standards in the U.S. and throughout the world.” Now he is arguing that the Democratic platform must make the same argument—as part of a campaign that counters the crude populism of Donald Trump with an jobs-and-justice message that speaks absolutely and unequivocally to the great mass of voters who are worried about the economy.